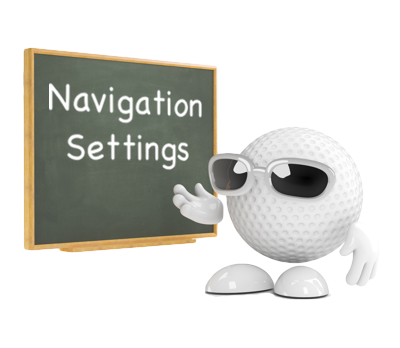 The 'Navigation Settings' allow you to edit the Navigation Tabs normally located at the bottom of the page. 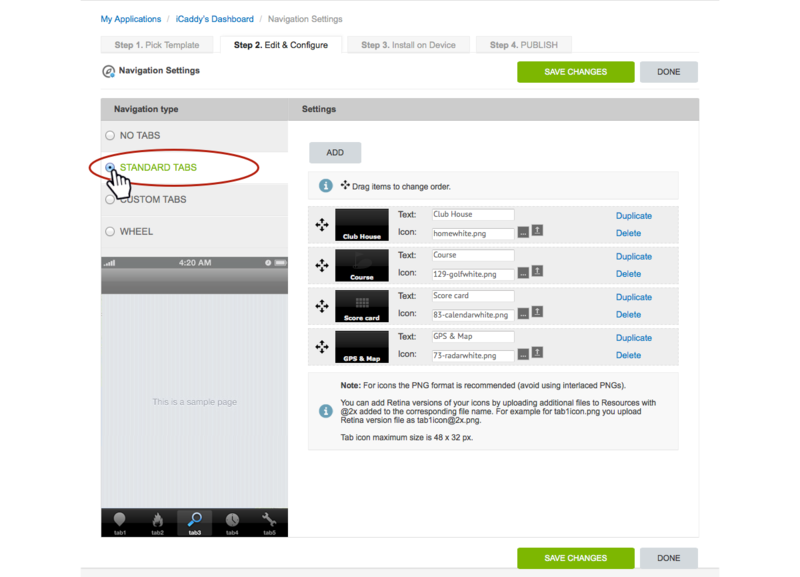 From the Application Dashboard select the 'Navigation Settings' option (as shown in the image above). The 'Navigation Settings' allow you to edit the bottom tabs (buttons) in your App. These settings provide full tab customizability. Your can edit the text that appears on the tab, the icon displayed, the color of the text, the color of the text when the tab is tapped (i.e. selected text color), the color of the tab etc. Note that not all settings need to be edited - the extent of customization is up to you. The various settings are self-explanatory (as shown in the image above). All iCaddy templates have 'Custome Tabs' set by default. See below for information regarding other (non-custom) tab types. Note: If you change the number of tabs in your App in 'Navigation Settings', you must also edit the 'Number of Tabs' setting in the 'Application Settings' for the App. 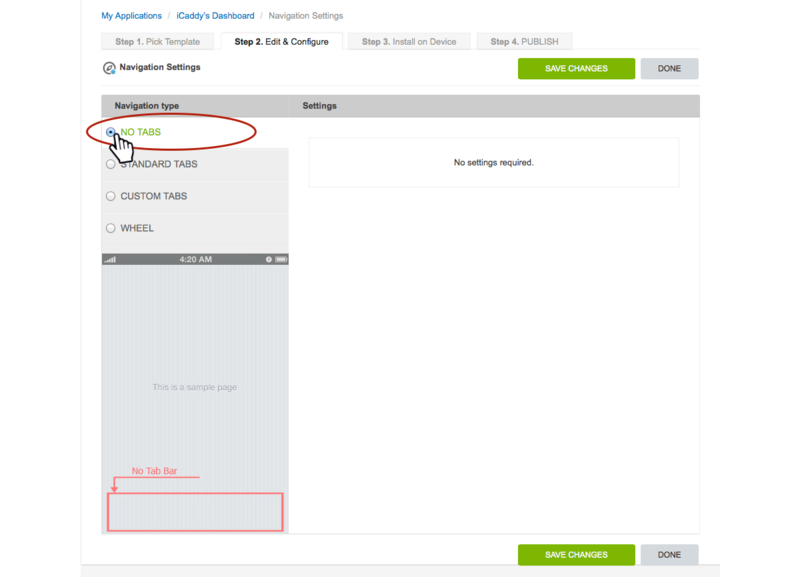 For more information on how to edit the tab settng in 'Application Settings', go to Application Settings. The appearance of 'Standard Tabs' will vary on different handsets (devices). It is for this reason that iCaddy templates are set with 'Custom Tabs'. Also, 'Custom Tabs' provide greater customization options. Note: If you decide to use 'Standard Tabs', you will need to change the icon images from white to black (noting that the color is inverted on 'Standard Tabs'). 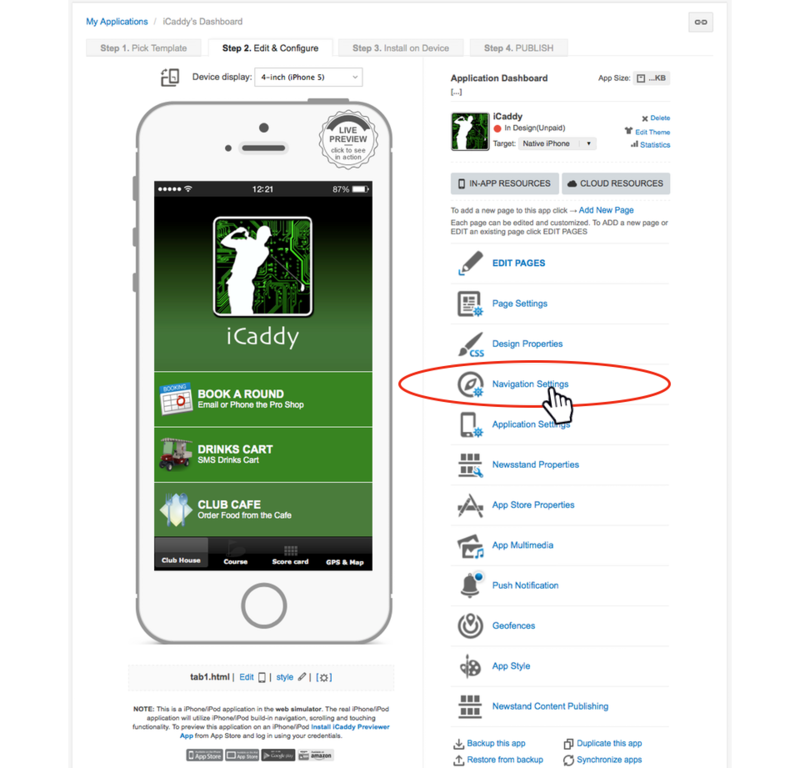 If this action is not done, the white icon images used in iCaddy templates will appear black and will not be seen against the default black background used on Apple devices. You can elect to have no tabs at all if preferred. 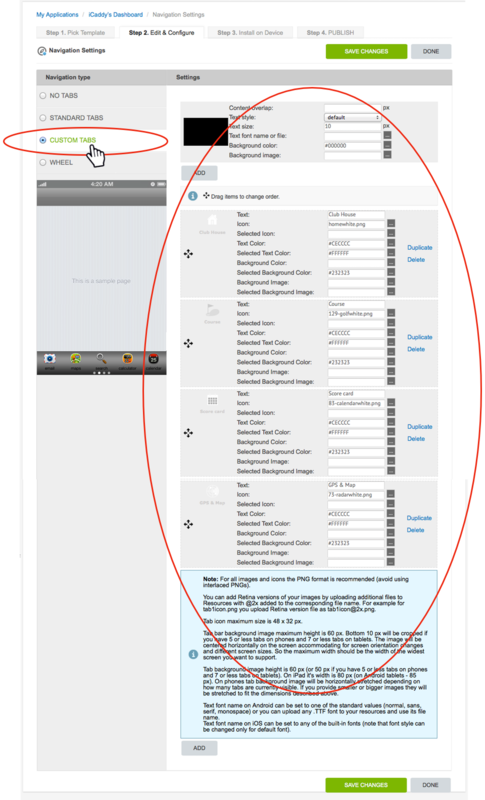 If this option is chosen, special care must be taken to ensure the App is designed to include navigation functions on each page. 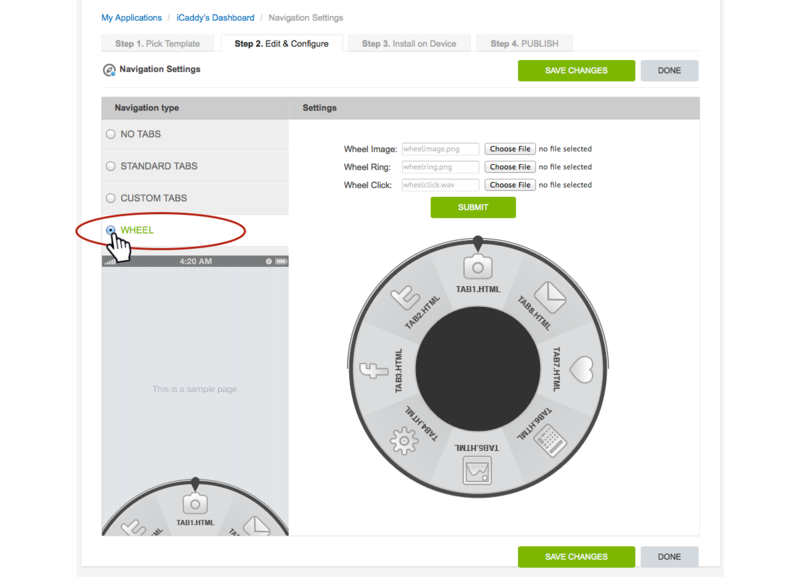 The 'Wheel' option has a revolving wheel that allows you to navigate around the App. The design of the tab wheel can be customized and also includes an audio file option that plays when the wheel is rotated. This tab type is recommended for advanced users only.